VFL: Round 21 in 60 seconds Watch highlights from Collingwood's 32-point loss to Footscray in round 21 of the VFL. Jordan Kelly left the field with an ankle complaint during the second quarter. Photo: Shane Barrie. The streak is over: Collingwood’s run of 12 consecutive victories has come to an end in the final round of the VFL home and away season. With the minor premiership up for grabs, the Magpies burst from the blocks, leading Footscray with four goals to zip in the opening 20 minutes. From there, it was all one-way traffic, as the Dogs kicked 16 of the last 22 goals to run out 32-point victors. A strong breeze favoured the Princes Highway end, but it was the home side that made the best of it, kicking six goals to one in the second quarter. “The wind probably played a small part, but they tightened up a bit around the contest and generated a little bit more play,” said Collingwood coach Dale Tapping of Footscray’s second quarter. “We knew they were going to be fast in their transition and try to make the ground big and open us up a little bit on the outside. They were endeavouring to do that in the first quarter. “We said at quarter time that they weren’t going to change the way that they play. They were committed to that, and they got a bit of territory off contest and kicked five or six goals in the second quarter. That put us under pressure and then in the second half it just became a real struggle. The retiring Brent Macaffer performed well in the midfield, pushing forward to kick two goals while having a hand in several other attacking forays. Ruck pair Jarrod Witts and Mason Cox were among the most influential players on the ground and gave their onballers first use after Bulldogs ruckman Tom Campbell left the field early in the match. “I thought Wittsy and Cox had some aerial presence around the ground for us. Campbell going off early meant we had the ascendency in the ruck, so you could say we should have had that, but at the end of the day you’ve still got to get it done. The day wasn’t without controversy; Ben Moloney was reported early in the second quarter, while star defender Jordan Kelly limped from the ground with an ankle complaint. Speedy forward Jordan Collopy also spent time off the field after a head clash. At the other end of the scale, it signalled the returns of experienced pair Michael Still and Jeremy Taylor. Both have endured a wretched run of injuries since arriving at the Holden Centre at the end of 2014 and had not appeared in any of Collingwood’s first 17 matches of the 2016 season. In the absence of Travis Cloke, Still looked dangerous at full forward, while Taylor improved across half back as the day wore on. 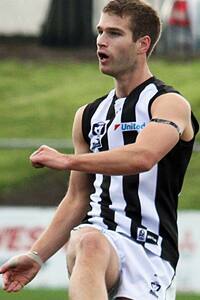 Casey’s win over Box Hill means Collingwood finishes the VFL home and away season in second place. The club’s first final will take place at Princes Park, most likely on Saturday, against Williamstown. Importantly, the Magpies have secured the double chance, and are guaranteed to play in the Semi-Finals should they fall to the Seagulls. Collingwood beat the reigning premiers in their last meeting in round seven. Stay tuned to collingwoodfc.com.au for full coverage of Collingwood’s VFL finals campaign during September 2016.